Samsung’s new Galaxy S6 and S6 Edge phones have few weaknesses on paper, but one is arguably the lack of a microSD card slot. For years, while the rest of the smartphone industry backed away from expandable storage, Samsung stuck to it, claiming that its customers would rather have the option. Whatever the reason was for cutting the feature from their new phones, it’s unfortunate, because storage companies like SanDisk are only going bigger and bolder with removable flash cards. 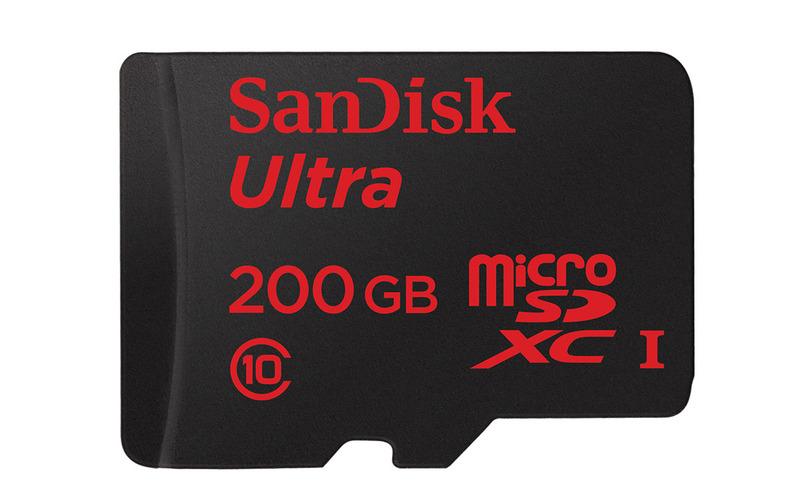 This morning, SanDisk announced a new 200GB microSD card that arrives in Q2. Just one year after introducing their 128GB card, SanDisk found a way to increase storage capacity in a micro SD card by 56%. It’s kind of insane to think that something this small can hold 200GB of storage. The card is capable of transferring up to 1,200 photos in a minute thanks to 90MB/s speeds, hold 20 hours of Full HD video, is rated Class 10 for fast video recording and playback, and is water, temperature, shock, x-ray, and magnet proof. If you buy the 200GB SanDisk microSD card, I can’t imagine you will ever need to buy another card again. Again, the card ships in Q2 worldwide with a sticker price of $399.